Interior Features In a serene 3.27 acre setting, this renovated modern retreat awaits the buyer with an appreciation of nature, architecture and privacy. Vast windows and decks showcase the beauty of the seasons. Gleaming hardwood spans the entry, study and dining room. The kitchen features slate flooring, stainless steel counters, high-end appliances, a walk-in pantry and a breakfast area. A handsome staircase leads down to the walk-out family room and up to the Great room which features a soaring ceiling and a sleek gas fireplace surrounded by natural stone and custom oak millwork. Upstairs, two secondary bedrooms share a hall bath. The master suite has a spacious sitting room with a Mid-Century modern fireplace, a bedroom with two walk-ins, a vaulted ceiling and a renovated spa-like bath. This home has truly been enhanced by quality improvements by its architect owner. 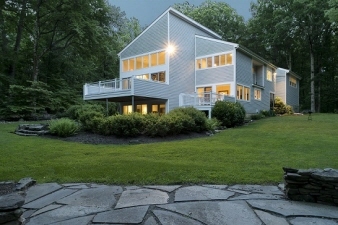 Located in East Amwell Township directly across from an Ecosystem Preserve.